You see; I had a teacher growing up who was an avid golfer. He was one of my favorite teachers, but when I graduated I didn’t get his contact info and the following year he retired. Sometimes, I wonder how he’s doing and I live in an area surrounded by golf courses. Golf is the one thing I associate with this particular teacher, probably because golf questions frequently made their way onto our exams as extra credit. Naturally, when I see a golf course it reminds me of him. My former teacher made golf references for everything. He referred to our grades using golf scoring, for example, if a student got an A on a paper he called it a “Hole in One” and a C grade was “On Par”. The class was constantly told which brand of golf balls were superior to use on the golf course. To get the attention of the class he would call out “Fore!” and everyone would instantly stop what they were doing. Sometimes, I’m tempted to call out ‘Fore’ to get attention when I need to speak at a noisy networking event…but I never do. It was on one of these walks down memory lane that I realized that both men and women play golf. That’s when I decided I had the answer to my question. Draw a card featuring golf. The design itself has roots in my memory of my former teacher’s many golf references, which is all I really know about golf. I drew a design of a golf ball in mid air because it reminded me of my teacher constantly telling us which brand of golf ball he preferred and how they would “fly faster and get closer to the flag” than other brands. 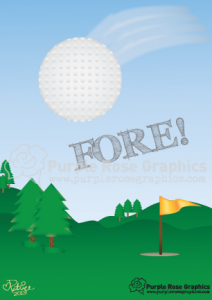 “Fore!” was added in because I wanted the card to really grab attention. I figured if that one word could get the attention of a bunch of rowdy teenagers, it could get the attention of anyone and made it the perfect card for any golf enthusiast. I invite you to take a look at my ‘Golf ball Card’ it’s blank inside and perfect for your favorite golfer. I know who I would send this card to if I could! Visit our shop today!